Modern roofing technology has undergone the most explosive proliferation of new technologies, alternative systems, advancements, improvements, and a plethora of "latest and greatest" in its history. With these new technologies comes the responsibility of the roofing professional to familiarize him or herself with the current state-of-the-art. For roofing jobs on existing buildings, the question faced by the roofing professional still remains the same: should an expensive new roof be installed or is there a retrofit alternative which will prolong the life of the existing roof? The answer may be a liquid-applied roof coating over the existing aged roof. Roofing technologies include the traditional built-up roof (BUR), plus newer systems, such as various types of single ply and modified bitumen sheets and spray-applied polyurethane foam with a protective coating. Since the 1980's, coatings are firmly established as an integral and required part of the urethane foam roofing system. The type of polyurethane used to make the foam is not durable if left uncoated and will begin to powder and degrade within weeks of application. Moreover, polyurethane foam is rather brittle and its skin can be cracked from impact with falling debris, heavy foot traffic, or severe hail storms. Coatings protect the foam from these potential mishaps. Liquid-applied coatings have also proven their utility over other substrates, and can be used to protect, restore, and prolong the life of aged existing built-up or other conventional roofing systems. Unlike re-roofing alternatives, they are extremely lightweight, adding virtually nothing to the load on the roof deck or supporting structural members. In fact, roofs may be re-coated several times without contributing significantly to the load. 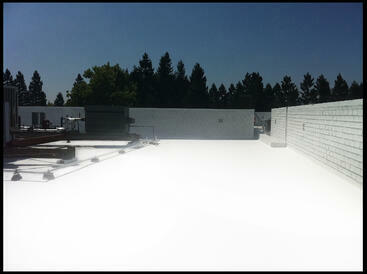 Because these coatings can be formulated white, they can be effectively used to impart reflectivity to the roof. This not only improves aesthetics, but also cools the roofing surface, contributing to longer service life. Since the surface of the roof is cooler, an additional benefit is a reduction in a demand for air conditioning. This has been well documented by National Coatings Corporation. The economic advantages of longer roof service life and reduced energy costs for air conditioning are the economic driving forces for reflective roof coatings. However, if aesthetics is a key objective, coatings can also be color tinted. Technically, these coatings are much more than paints. By definition, they are liquid-applied, fully-adhered, elastomeric functional membranes formed in-situ on the existing roof. In the sense of being adherent to the substrate to which they are applied-in this case, the existing roof-they are paint-like. However, their elastomeric feature, which distinguishes them from paints, means they are also flexible. This flexibility, or elasticity, must exist not only at one temperature but over the temperature range existing in any particular building's climate. Elasticity enables the coating to tolerate a roof's movement as it responds to the stresses caused by temperature changes, settling of the foundation, weight loads caused by ice and snow, and seasonal expansion and contraction of the roofing envelope. These coatings are normally applied at film thicknesses of 20 to 30 dry mils (.020 inch to .030 inch) using a roller, spray, or brush. By comparison, paints are applied at two to three mils, thus making these roof coatings approximately ten times thicker than traditional paints. Roof coatings can be classified into three types: solvent, water-based, and 100 percent solids. Solvent systems are those containing an organic solvent as carrier for the coating. In this case, solvent evaporation causes the coating to form the membrane on the roof. Water-based coatings employ water as this carrier. The third class, albeit less common, is the solvent-free coating where two liquid components are premixed in a specially designed airless spray unit; a chemical reaction causes some of these two-part coatings to dry almost immediately. Each of these three coating classes has specific advantages and disadvantages relating to the type and presence or absence of solvent. For more information on roof restoration or roof maintenance – download our FREE Brochure! The concept of “Green Construction” has quickly taken center stage among commercial building design professionals. The LEED program (Leadership in Energy and Environmental Design) established by the USGBC (United States Green Building Council) has created a framework for the design and construction of buildings that are more “environmentally friendly” and have a lower impact on energy. While the LEED program specifies a roof/roof covering that has high solar reflectance and emittance, many of the materials and designs that were used prior to LEED have not changed. Moreover, building owners/facility managers are often lulled into a false sense of security when presented with a 10/15/20 year warranty by the installing roofing contractor. The warranty document implies that any leaks will be repaired for the length of the period, so why worry? Even though a roof may contribute to the building’s gold or silver LEED rating, this does not change some of the basic and fundamental obligations of the building owner. Nor does it change how the roof deteriorates or how it can be maintained. A basic LEED premise is that the construction materials used will have a limited impact on the environment; this includes the use of recycled materials. While this is an admirable goal, it is counter to the current status of roofing industry in the United States. While roofing accounts for only 0.1% of the GDP (all the goods and services), it is estimated to account for over 6% of the landfill. This disparity is still left unresolved by the good intentions of the LEED program. Legislation and implementation of the LEED program alone cannot supplant the fundamental responsibility of the building owner/facility manager for prudent preventative maintenance. All equipment requires maintenance. HVAC, elevators, escalators are routinely serviced by trained maintenance personnel. Their actions can be as simplistic as oiling motors, lubricating bearings, and vacuuming enclosed compartments. However, these actions still qualify as PREVENTIVE MAINTENANCE. The basic idea here is to conduct these maintenance activities as an alternative to the more costly repairs that may be required if the preventive maintenance is not performed. It is well understood and generally accepted that these maintenance activities, if not performed, will contribute to unwanted and unneeded downtime, and costly and time consuming repairs. Consider the simple analogy of the crankcase oil in the family car: Periodically the oil level is checked to insure there is sufficient oil in the crankcase. If it is low, additional oil is added, and if the color or odor looks improper, further immediate repairs are warranted. Then, at regularly scheduled intervals, the oil and filter are changed. All these actions are designed to insure the longest service life and least operational interruption for the car’s engine. If these activities are not performed, more serious and much more costly consequences await the building owner. It is much easier, more convenient and less costly to change the crankcase oil than to replace the entire engine, when the engine begins to smoke and seize up. The overarching general premise here is that maintenance costs are inversely related to and much lower than repair costs. Using this analogy, consider a roof. While it has no moving parts, it still qualifies as an asset or piece of equipment. Its service life (not to be confused with the length of the warranty) will be dramatically improved by the amount of preventive maintenance that is conducted on it. Warranties do not cover blocked drains, plant life growing on the roof, damage caused by foot traffic, or actions of other construction and maintenance trades, or natural causes, such as tree limbs or hail. Thus, at the very least, the roof should be inspected at least twice each year, preferably in the spring and fall. Drains, flashings, curbs, downspouts, can be inspected to insure they are free flowing and not clogged. The field of the roof can be “walked” and checked for splits, fish mouths, holidays, and punctures. The general condition of the field of the roof can be noted to see if it is exhibiting signs of premature wear or deterioration. If the roof has smooth stone ballast, the stone should not accumulate in large piles, leaving other sections uncovered and exposed. These piles can be easily respread over the roof in order to protect the membrane. If the roof has gravel surfacing, the degree of erosion from the membrane should be noted. It is these granules that protect the underlying roof membrane. This may be an appropriate time to apply a protective roof coating to the roof to extend its life. If the roof is already coated, the coating should be inspected to determine if the roof may need recoating. The coating and the stone/granules described above protect the roof from the harmful effects of the sun’s ultra violet light. Providing this “sunscreen” will greatly prolong the roof life. The roof/wall transitions can be inspected for loose base flashings, detached counter flashings, and other “suspect” areas that appear to be potential sources for water intrusion. While some of these descriptions border on the more technical aspects of roofing, the fundamental concept here is that if the roof doesn’t look like it did when it was installed; something adverse is happening to the roof. These activities do not require the expertise of a trained roofing professional. However, periodic inspections every few years by a qualified roofing professional such as a Registered Roof Consultant, RRC, are recommended to insure nothing has been missed by the cursory semi annual overview field inspection. At that time, the consultant may recommend a maintenance coating or some modest repairs to areas of the roof that are weathering excessively. In spite of the cost to have the roof professionally inspected, this expense can be easily offset by the savings of not having to effect major repairs or suffer the consequences of interior damage to the building equipment or employee downtime and lost productivity. Building owners and facility managers who embrace the concepts of LEED and “green” building should also feel responsible to insure their roofs are adequately maintained. This begins with routine inspections and preventive maintenance. All this will assure the longest possible service life and reduce the need for premature roof replacement. Download our FREE Guide to Roof Coatings for more information or check out our Full Line Brochure to find the right roofing system for your building. Click here to view our LEED Compliant Roofing Products!